LP records new coordinates for phosphates and oxygens found within his structure of nucleic acids. Letter from LP to Guggenheim Memorial Foundation RE: reviews of various scholars applying for chemistry-related fellowships. [Filed under LP Science: Box 14.015, Folder 15.1]. I am glad to have news from you about the nucleic acids. I have not understood why the Cambridge people should object to our structure as a structure for nucleate ion as well as nucleic acids. I think that I mentioned that the hydrogen atoms might be between the central oxygen atoms, in such a way as to form hydrogen bonds. The contact distance, 2.50 Å, is, however, a satisfactory one as van der Waals contact even when hydrogen atoms are not present – it is observed in many ionic crystals, such as the three forms of titanium dioxide, and also alumina. We did not try to place the sodium ions in sodium thymonucleate. They would, of course, be out some distance from the axis of the molecule. I am checking over the nucleic acid structure again, trying to refine the parameters a bit. I think that the original parameters are not exactly right. It is evident that the structure involves a tight squeeze for nearly all the atoms. I heard a rumor that Jim Watson and Crick had formulated this structure already sometime back, but had not done anything about it. Probably the rumor is exaggerated. We are glad to learn about what is going on at London. We had heard last summer that Miss Franklin was leaving, and then had heard that she was still there. Your letter tells us that she will be gone in a couple of months. I think that Miss Cowan, one of Dorothy Hodgkin’s girls, is supposed to go there. Miss Cowan attended my lectures in Oxford. She seems to me to be very good. I don’t think that I have ever met Miss Franklin. Also, I think that I have not met Wilkins, but Corey knows him, and has a very good opinion of him. Sid is coming. He ought to be there by this time – I think that he was to leave New York on the fourteenth. I hope that he gets the package to you that Mama sent to New York for him to bring. As to the car, I do not want to buy a Jaguar at the present time. First, I want to save some money, if possible. Also, I like having a sports model, although right at the moment I am not quite so enthusiastic. Mama and I spent two days out in the desert, at Calico Mountains, and we had the top down the whole time. I have been suffering somewhat from a sunburned face for three days now. I do not want a Riley salon, and I judge that you are right in saying that they aren’t making the drophead coupe. I do not want a Jaguar this summer. Would you look into the matter of a Sunbeam-Talbot? Here I want the drophead coupe or sports car, with room for at least three people (I think that it would not be courteous of us to get a car holding only two people). The Sunbeam-Talbot looks good to me. If you think that its price is satisfactory get it. I believe that it is described as $2800 delivered in Los Angeles. Could you do some scouting around in connection with our return to the United States? I have not had any luck with the travel agency here, in making reservations to return on a freighter, and to bring the car along with us. Mr. Bennett seems to very pessimistic in talking with Mrs. Wulf about this possibility. What Mama and I have in mind is that we would fool around in Europe, after the International Congress in Stockholm and Uppsala, which ends about the fifth of August, for several weeks in August, and then start home, about 20 August. We need to be in Pasadena by 15 September. We thought that if we could get on a freighter in Sweden, together with our car, we could then arrive in New York or some other American port – perhaps even New Orleans – by the end of August, and could drive home. We would want to have time enough for a pleasant trip across the continent – 8 or 9 days, say, from New York. If we could get from Europe to Los Angeles on a freighter, through the Panama Canal, without spending more than three weeks on the trip, we would be willing to consider that. I think that we could not stand as much as a month on a freighter – three weeks is enough. I would prefer landing somewhere on the east coast, or the Gulf, and driving on home. The time is flexible, provided that we get to Pasadena by 15 September. We should like, however, to stay in Europe as long as possible, preferably until the 20 August, or even a few days after that. We could embark anywhere in continental Europe – it is not necessary that we get on the freighter in Sweden, because we could drive back to Holland or Belgium, say, or France, and embark there. I think, however, that we would not want to travel on a freighter under registry other than one of the northern European countries. Would you check up at a travel agency, and let me know as soon as possible? Also let me know your recommendation about the Sunbeam-Talbot. I have received official word from the Unitarian Service Committee, inviting me to spend 25 days in Germany - 1 July to 25 July 1953. I am supposed to participate in two or three symposia, on the nature of muscle, and to visit departments of physiology in the German universities. The principal symposium is to be at Tübingen by the 8th of July, and probably we should arrive in Tübingen a bit before then. I enclose the check for 1 March. We have deposited $50 in your savings account here, the proceeds form cashing two $25 war bonds that have matured. Letter from Margaret Cooper, W.H. Freeman and Company, to LP RE: Acknowledges that LP will send the completed chapter 8 of the second edition of College Chemistry to the publisher as soon as it's available. 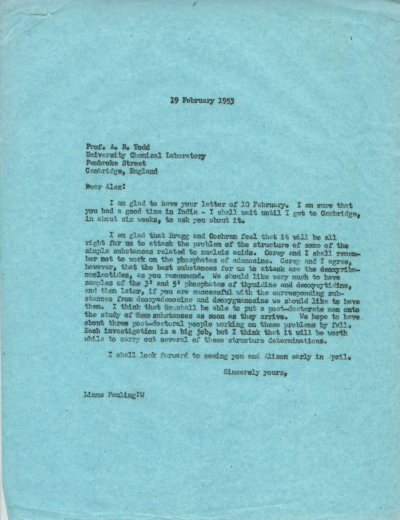 [Reply from LP to Freeman February 20, 1953]. [Filed under LP Books: Box 1953b, Folder 1953b.1].